Transform ordinary tap water into great-tasting, healthy water with Aquasana's innovative filter. Get always available, healthy water, right from your tap. No need to ever refill or wait for a drip pitcher again. This water filter system provides the healthiest, best-tasting water by selectively filtering more contaminants like lead, chlorine, chloramines and cysts while preserving beneficial minerals like calcium, potassium and magnesium. Aquasana gives you exceptional value, with water costing as little as 2.6 cents a litre When you replace your filters every six months. Each time you replace the filters, you can give yourself credit for not using 4,000 475mL plastic bottles. 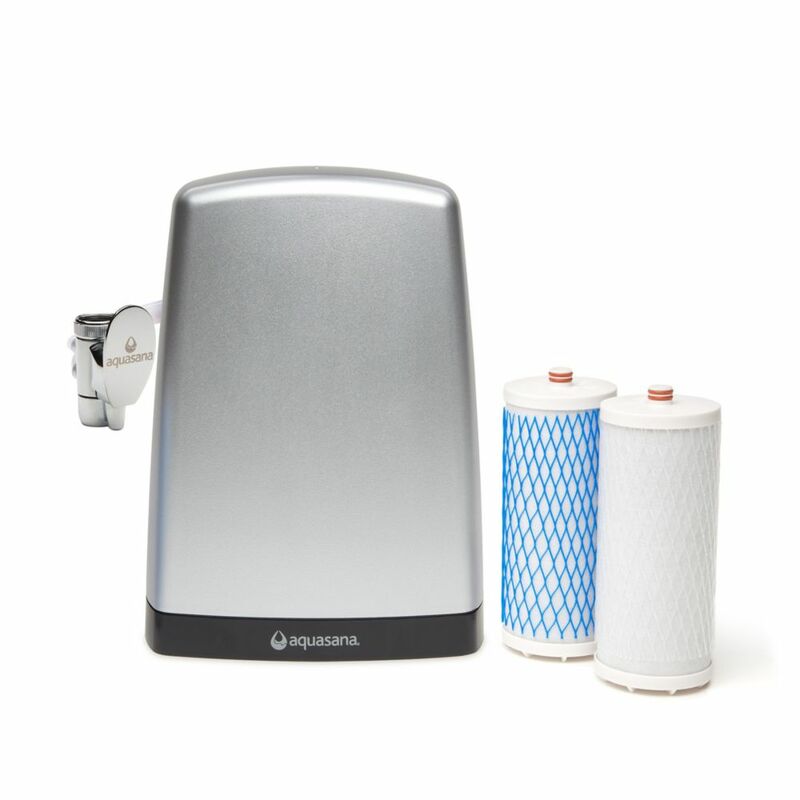 Premium Counter Top Water Filter System in White Transform ordinary tap water into great-tasting, healthy water with Aquasana's innovative filter. Get always available, healthy water, right from your tap. No need to ever refill or wait for a drip pitcher again. This water filter system provides the healthiest, best-tasting water by selectively filtering more contaminants like lead, chlorine, chloramines and cysts while preserving beneficial minerals like calcium, potassium and magnesium. Aquasana gives you exceptional value, with water costing as little as 2.6 cents a litre When you replace your filters every six months. Each time you replace the filters, you can give yourself credit for not using 4,000 475mL plastic bottles. Premium Counter Top Water Filter System in White is rated 3.7 out of 5 by 23. Rated 4 out of 5 by Sam from Had to use a different adaptor than provided,but when installed... Had to use a different adaptor than provided,but when installed it works fine. Would recommend to others looking for a quality filter. Rated 4 out of 5 by Traci from It does what it’s supposed to.... It does what it’s supposed to. Rated 4 out of 5 by KO from I love aquasana and after having my last one 10... I love aquasana and after having my last one 10 years I was due for a replacement. Great price, but the tubing is a lot shorter than my last one which is inconvenient, but it functions great. Rated 5 out of 5 by Lo from I was very skeptical of a new countertop filtration system... I was very skeptical of a new countertop filtration system because the one I had did me well for many years. But this has exceeded my expectations and calmed my fears. It was very easy to set up. I'm a woman I did it without help. Absolutely let the water run through it for the full 10 minutes. Rated 3 out of 5 by Grady from I have bought these counter top water systems for years.in... I have bought these counter top water systems for years.in the beginning they were great.they have become a poorer quality. Stream of filtered water slow.the ones I purchased does not last as long as stated. The reason I rebuy them , I'm use to them,hoping they will go back to the original quailty. Rated 1 out of 5 by ethan from quality of water after filtered has very little improvement from the tap water. i use a tester an... quality of water after filtered has very little improvement from the tap water. i use a tester and compared with at least two kinds of bottled water, the reading from tap water is about two points. i drained about six gallons and after about a week of use its still the same.this is a total waste.